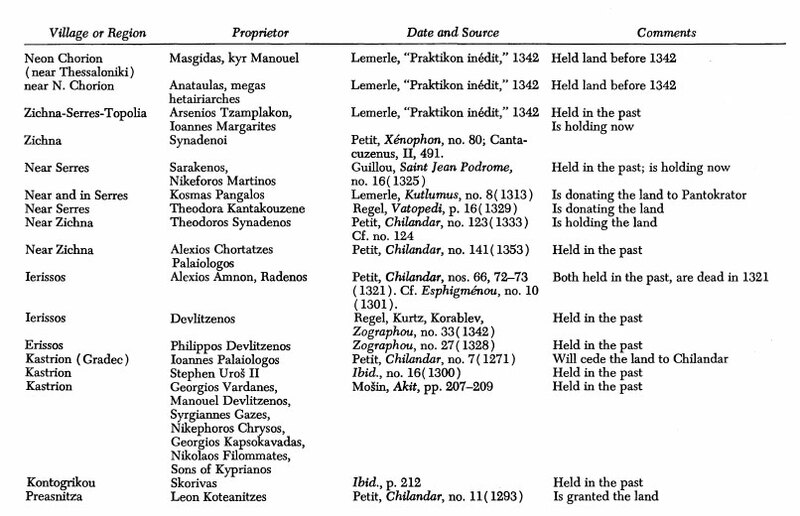 Examination of Macedonian Names of 14th Century in the Themes of Thessalonike and Strymon reveals the Greek Character of Macedonia. THE study of names can tell us a great deal about a society, for names are primarily a means of social identification. People identify themselves or are identified by others in ways which may reveal kinship patterns, migration movements, economic differentiation or social stratification, superstitious beliefs. Children may habitually be named after the paternal or maternal grandparents, after parents or Siblings. 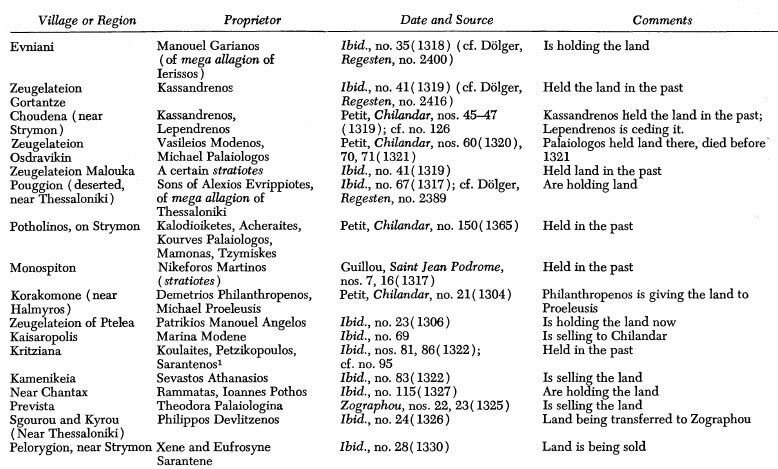 Names may show adherence to a religion or to superstition: the Byzantine parents who named their children Aporicto or Evreto (“rejected” and “founding”) were trying to deceive death, while a man named Prousenos testified to his parents’ nostalgia for a lost homeland in Asia Minor. Proper or family names which continue over more than one generation can show the interest of the family itself or of the state in identifying people over time. The Byzantine peasants in Macedonia of the fourteenth century were commonly identified by a baptismal or given name and some other form of identification: a profession, an indication of geographical origin, a nickname, or an indication of relationship to someone else. Both the given names and the “family” names are of interest here. It is characteristic that those who from time to time are designated as Μακεδόνες (=Macedonians) are always members of Byzantine society or the Byzantine army, speaking the same language and apparently following the same faith. In no case could any Bulgars, Slavs or Turks who were known to have settled in the region after a certain period ever be described as Μακεδόνες. Michael, Manouel, Stamates, Theodoros. 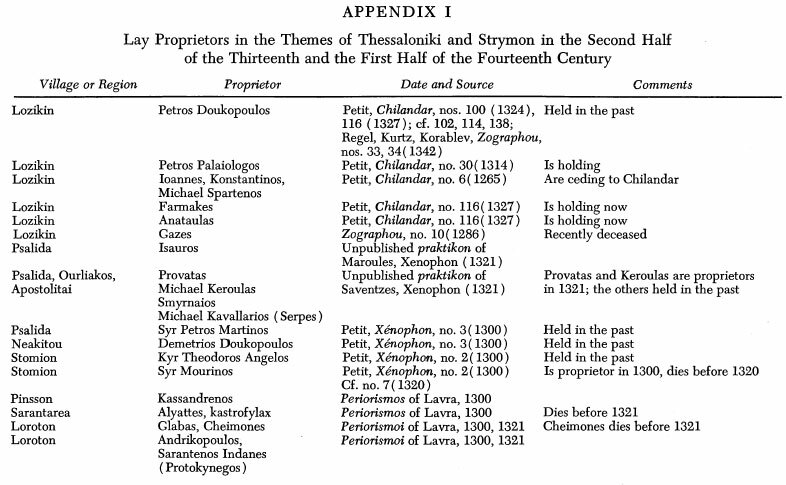 Somewhat less frequent are the names Modestos, Nikephoros, Theiotokios, Kyriakos, Foteinos, Athanasios, Petros, Alexios, Stefanos, Xenos. 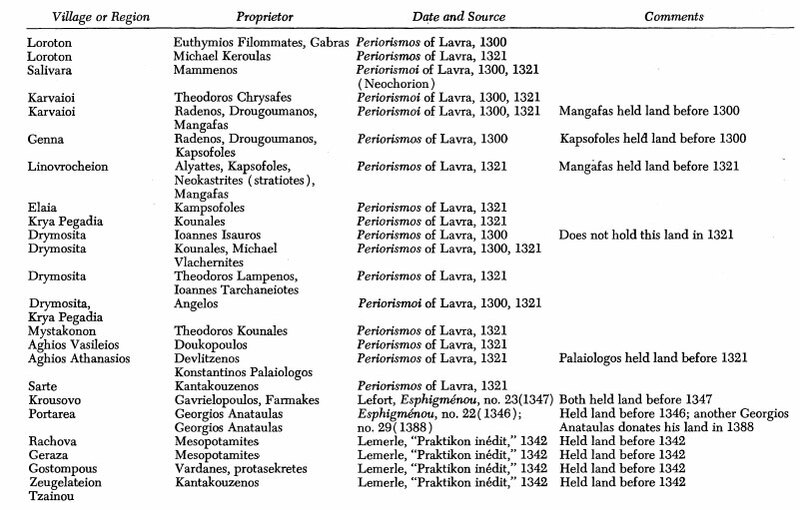 Most of these, with the exception of Xenos, Alexios, Modestos and Foteinos, are also common modern Greek names. On the other hand, Evangelos and Eleutherios, which occur frequently in modern Greece, are rare in the fourteenth century. (3) Those deriving from feasts of the Christian calendar. In the first category, we find Theodoros, Theodora (“gift of God”), Manouel from Emmanuel (the popular form Manolis does not appear in our documents), Theochares, Theiotokios (from the Theotokos, or “mother of God”), Panagiotes, from the adjective of the Virgin which qualifies her as “most saintly,” and Christina. Maria, of course, was a very common name. The saints most often celebrated in peasant names were Theodore, Demetrius, and George (all military saints), Athanasius and Basil (the fourth-century church fathers), Constantine, the first Christian Emperor, and Helena, his mother. St. Peter is frequently represented, and the name of his assistant, Andronicus, appears occasionally. A whole series of baptismal names consists of toponymics, something which one would not expect. Giving a child the name of a city or an island must mean that the family had had recent connections with the area referred to. In all three apographai under discussion, the greatest number of toponymies comes from Macedonia itself but, of course, outside the domain in which these families are found. This is an expected and logical situation. It simply means that the population of mobile one, moved more easily within rather confined boundaries. Names like Fourneiotes, Kasandrenos, Melenikeiotes, Ravenikiotes, Didymoteichites, Zigniotes indicate that the families had migrated within Macedonia from one domain and one region to another. 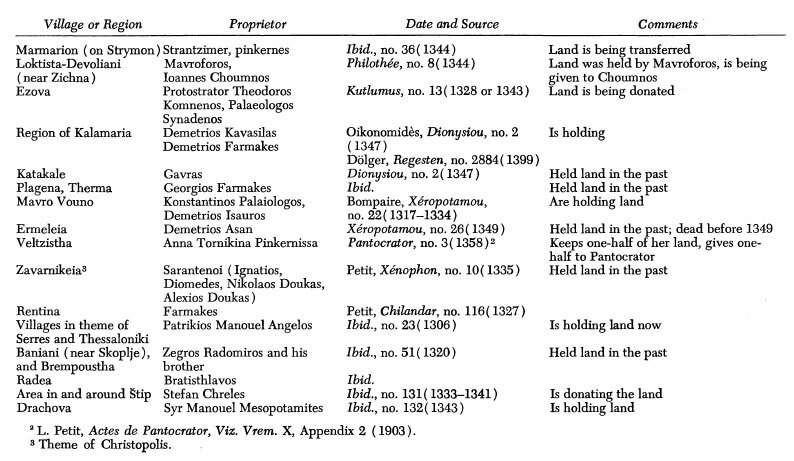 Immigration from the rest of Greece, as suggested by names such as Thebaios, Korinthios, Moraites, could be as old as the Latin occupation,but has no reason to be; it is more likely that the emigration in question followed the reestablishment of Byzantine power in Macedonia, and perhaps even the reestablishment of the Empire at Constantinople. Immigrants from the islands of the Aegean (that is, people bearing the names Lemnaios, Nesiotes, Naxiotes) probably came to Macedonia in the second half of the thirteenth century, after the wars of Michael VIII with the remaining Latin states had made life on the islands uncertain. Some names are obviously of foreign origin, of these mostly are Slavic but also French, Italian and Spanish. Dragos, Draganos, Slanna, Tobranna, Dragna, Zougla, Malha, Merzana, Volkanos, Tobromeros, are all Slavic names. Imbert the Franc(“Μπέρον ο Φράγγος,”) was probably of French origin, while Nikephoros Idalkos, son of Dominick, was the offspring of a Spaniard, perhaps a member of the Catalan Company who had for some reason remained in Macedonia after the invasion of the region by Catalan mercenaries in 1307-1309. It is characteristic that those who from time to time are designated as Μακεδόνες (=Macedonians) are always members of Byzantine society or the Byzantine army, speaking the same language and apparently following the same faith, and that they never appear to turn, as the head of a certain group, against the Byzantine state. This category does not appear to include the more recent immigrants to Macedonia, evidently because they retained their own ethnic particularity (language, religion, culture, etc.) and, more important still, their independence from the Byzantine rule. Thus, for example, in no case could any Bulgars, Slavs or Turks who were known to have settled in the region after a certain period (and who, indeed, became the permanent residents) ever be described as Μακεδόνες (=Macedonians).